I've got my cousin's old (well, few month old) Bamboo tablet for my coming birthday (27th July), because he moved onto Intuos, so I've though that I finally will make use of my dA account and make some mob concept art. From distance, it looks like ordinary piece of stone. But when player comes into 4 meter radius, it shows it true nature. Immediately shows its teeth and open his red eyes which happens to glow in the dark (their light, however, doesn't prevent Spionions from spawning in the area). Attacks by jumping onto player and bites him painfully. When misses player and fall on ground, it turns that ground into solid stone (not mixed with other materials like dirt) within radius of 1 meter. HP: 7, Def: 3, Atk: 2. .. you made that with a bamboo tablet? Not sure if srs..
(07-13-2012 11:07 PM)SabotageTheFool Wrote: .. you made that with a bamboo tablet? Not sure if srs.. It looks like it was made with a pressure-sensitive tablet. Well, atleast he made an effort, which is more than I would do. I do quite like the idea of innocent things coming alive when you get near them but I wouldn't like shooting every bush I see, just in case it was evil. Also, with their attack damage, it sounds like Dorf's don't stand a chance against those mobs. Or, the opacity was set to be random, or based on speed, or something. Or he used mypaint to make this, this looks a lot like mypaint. Yes, I've used mypaint and yes, I am using bamboo pen tablet. Oops, I've meant 85% of attack. Was tired when I wrote descriptions so wasn't able to do the math. Gonna go ahead and ask.. What age are you, darkhog? You are so picky about his skills. It's all about IDEA. 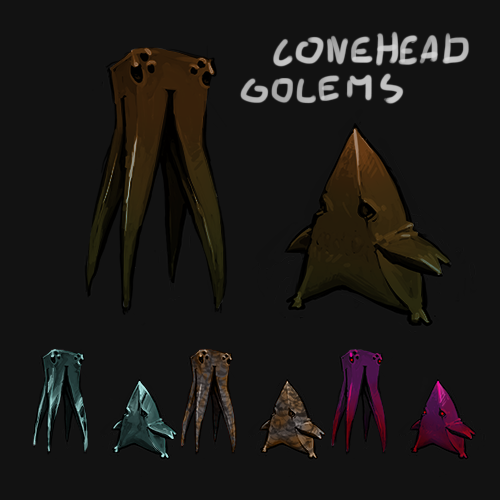 I like this conehead mob concept. I imagine them as kind of golem that pops out from the ground (as spiky rock) or falls down from the celling (as stalactite), dealing damage and then assuming its golem-ish form. They also would have properties and texture same as their "breeding ground". Add to this geomancer Dorf and we have FUN! This idea was nice. It only needed little polishing. (07-14-2012 04:52 PM)SabotageTheFool Wrote: Gonna go ahead and ask.. What age are you, darkhog? 22, why? Also it isn't my best work, just go see other pictures here. It was meant to show my idea, not be super picture. It'll end up as models anyway when used. 'cous I did change this idea . Merged Conehead concept with toothrock, turning it into player spawned and controlled familiar, not random mob. Original Conehead is too... random, while toothrock and psibush appear to be horribly annoying in long run. btw, "It'll end up as models anyway when used.". Models based on what? You need at least BASIC conceptart to make a good model.